As fall comes to an end and the holidays approach, hiring numbers are on the rise. Both the unemployment rate (5.8 percent) and the number of unemployed (9.0 million) decreased in October 2014. Since the beginning of the year, the unemployment rate and the number of unemployed persons have declined by 0.8 percentage point and 1.2 million, respectively. In October, the number of long-term unemployed (those jobless for 27 weeks or more) remained flat, around 2.9 million individuals. These individuals accounted for 32.0 percent of the unemployed population. Over the past 12 months, the number of long-term unemployed has declined by 1.1 million, which is great employment progress. The civilian labor force participation rate remained flat, overall, at 62.8 percent in October. This number has remained consistently stable for the entire year. The employment-population ratio increased to 59.2 percent in October. Employment in professional and business services continued to increase this month, with 37,000 jobs added. 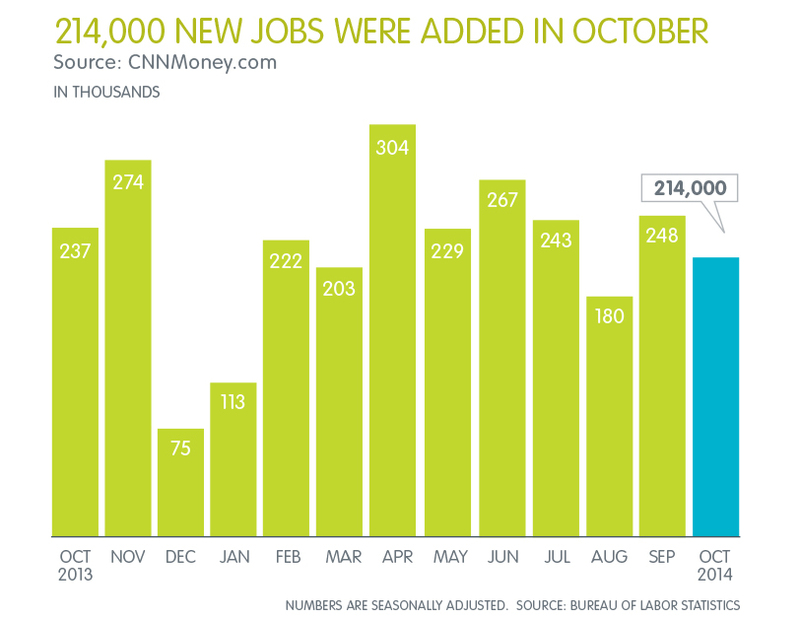 In the past 12 months, an average of 56,000 jobs were added per month. October employment continued to trend up in temporary help services, with 15,000 jobs added to this sector. Throughout 2014, employment in professional and business services has grown by an average of 55,000 per month. Employment in other major industries, including mining and logging, wholesale trade, information, financial activities, and government, showed little change over the month, but still remain strong employment sectors. The average workweek for all employees increased by 0.1 hour in October, bringing the total to 34.6 hours. The average workweek for production and nonsupervisory employees on private nonfarm payrolls edged up by 0.1 hour to a total of 33.8 hours. With holiday hiring around the corner, this number is expected to rise in the upcoming report. Average hourly earnings for all employees increased by 3 cents to $24.57 in October 2104. Over the past 12 months, average hourly earnings have risen by 2.0 percent. In October, average hourly earnings of private-sector production and nonsupervisory employees increased by 4 cents to $20.70. By subscribing below, you’ll get instant updates and analysis on the latest workforce and hiring trends impacting the United States job market.